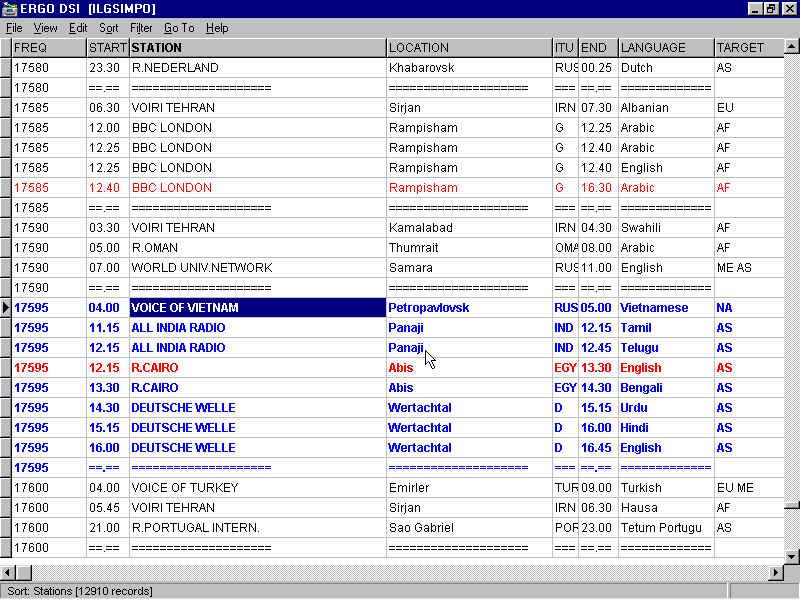 Welcome to my Shortwave Radio Page! Well this is the section that deals with my favorite hobby.Shortwave radios! Read on for a lot of info ,pictures,and more . So you are asking," Just what the hell is a shortwave radio?" I knew you would be! Shortwave radios are radios that receive overseas radio stations in the area of the radio frequencies above your AM radio dial. Numerous countries use this service to transmit news, music, religous programs, and the occasional political propaganda. Some countries broadcast these programs to outside their borders to expatriates or other people interested in their country while other broadcasts are meant for the English speaking North American listeners.So not all programs will be in the English language. Also other organizations such as weather bureaus, press services and various non governmental organisations such as the International Red Cross use this area to transmit data,weather reports and things like that. The military is also one of the largest users although they are moving more and more of their transmissions to secured satellite services.However they can still be found all over the shortwave bands usually in USB -Upper Sideband- modes with radio checks,phone patches,status reports and the somewhat infamous EAM -emergency action message. Another big user is the maritime service or ships at sea as well as aircraft on long distance oceanic flights. These are aircraft with callsigns like Speedbird # 17 or whatever.Speedbird was the British Airways callsign for their Concorde aircraft.Lots of aircraft flying overseas and on long distance oceanic flights can be heard on several band segments with a simple receiver that receives single sideband, as well as the Air Traffic Control centers on the ground such as New York Radio or Shannon Radio. How I found myself becoming a shortwave listener ! Since I started in this hobby,my interest has continously increased to the point where I think at times I have over extended myself in trying to improve my listening post. Once started it becomes a never ending game to constantly see if this radio can be made better or maybe this antenna needs to be longer and higher! I first started listening to shortwave in 1990 when my dad gave me an old all in one type of radio like you see at flea markets with the funny plastic antenna on the top of the portable's casing or on the very top shelf at Radio Shack.This one was some off brand and I don't even remember the name ,but it sure wasn't from anyone I had ever heard of and I had been in or around the business of selling TV's and stereos all my life ! It had the regular AM ,FM and then some VHF,Marine,CB and two switches marked SW1 and SW2. Well,one night I turned that thing on at the apartment I first lived in back in Lousiville,flipped the switch to SW1,and heard Radio Exterior de Espana in English !This was on just the whip antenna and I guess I was lucky it was near the bedroom window .As soon as I heard the station id'ing as coming from Madrid Spain I was hooked. Of course, with an analog tuned radio it was lots of fun to try to find them again the next night, but from that moment on I never looked back. The number and range of stations I have heard is too big to completely list here but here is an idea of what I have heard: Radio Algiers, Radio Australia, Radio Austria Intl, BBC, Radio Bras-Brazil, Radio Defusion de Benin, Botswana, , Radio Canada Intl. Colombia National Radio, RTV Cameroon, Radio Cairo, Deutsche Welle-Germany, Radio Ethiopia, Radio France Intl, Gabon Radio One, HRT-Croatia, Voice of Indonesia, Radio Japan, Radio Pyongyang-North Korea, Radio Lithuania, RTV-Marocainne-Morocco, Radio New Zealand Intl, Radio Oman, Radio Pakistan, Radio Romania Intl, Radio Singapore, Radio Thailand, Radio Ukraine Intl, Voice of Vietnam, Xerta Radio -Mexico, and Zambian National Broadcasting Service among others. I realize this was somewhat alphabetical, but just an idea to show what all can be heard out there. Overall, I would have to say the three best catches I have had would be RTM-Sarawak from Malaysia, Radio Uganda from East Africa, and Radio Mali from West Africa. I also have made it a hobby to see what tropical band stations I can find. These are very low powered stations using maybe 2 kilowatts at best for a local audience or region and aren't really meant to be heard outside the immediate region. I have heard some really good ones such as Radio Tacna from Peru, RTM Sarawak from Malaysia, RRI Unjung Pandang -Indonesia, PNG Radio -Port Moresby -Papua New Guinea and many many others and I still have just barely scratched the surface on this part of the hobby. Also of interest has been hearing Air Force flight crews ordering beer to be delivered to their aircraft for a New Year's Eve party at a remote base, maritime ship to shore calls with Russian stations, an air traffic controller in Khartoum Sudan working aircraft in the Northeast African air corridor as well as using a digital decoder to copy morse code sent by ham radio operators and military stations. I recently began an interest in clandestine stations as well. I don't have much experience in tracking these down as for the most part they seem to move all over the shortwave bands and also use low power. But I have been lucky sometimes. Not too long ago I heard my first Ethiopian clandestine called The Voice of the Tigray Revolution which was really cool :) You're probably saying "What the hell is a clandestine? " Well they are stations that oppose a government in power or are a part of the population that wishes to create their own nation and as a result they broadcast their views to those who may support them. Currently my listening post consists of the Ten Tec RX320 and a Radio Shack DX440. Some other radios I have owned over the years include the following equipment: Motorola-built R-390, Drake R-4A,Realistic DX-380( paperback sized digital portable), Hallicrafters SW-120, Realistic DX440 ,and it's twin the Sangean ATS803A.I hope to add to my listening post as funds and time allow. I recently moved to NYC, so a lot of my equipment is no longer in use due to not making it through the move. However on a more positive note, while out job-hunting one day , I ran across a antique radio shop down in Lower Midtown that had a ton of radios , and even a few shortwave sets from Hallicrafters, Hammarlund, and had a few Zenith Transoceanics as well. I have my eye on a Hammurlund SP120 they have there. Also I found out about a radio shop in Queens that has a lot of radios of the tube type variety possibly for sale. I have also played around with decoding morse code and rtty using an Info-Tech M-600 Digital Decoder and a Tono 350 Decoder. The antenna's have varied throughout the years. I'm sorry to report that first radio I ever owned ended up being broken later on after it had the band dial go bad and I tried to fix it. This picture below is another neat tool for use in shortwave listening .It is the ERGO DSI program and shows in a easy to read format what is on the frequencies at what time and where beamed to . It can use the ILG radio database or others and can convert them to use in this program. It is outstanding and I would recommend it to anyone who is an avid DX' r. The red lettering is what is on the air at the current time and you can look up stations, frequencies, times or locations .It is very easy to use and it works very well for me . However, now I have found out the ILG database is no longer available due to whatever reasons the maintainer had. There are some online databases still available, the accuracy depends on how often they update. THIS IS A NICE LITTLE TOOL TO HAVE TO SEE WHAT STATIONS ARE IN DARKNESS FOR A BETTER CHANCE OF HEARING THEM .LOOK FOR THE LINK ABOVE TO GET YOUR COPY OF THE PROGRAM. SCREENSHOT WAS TAKEN COURTESY OF SNAG-iT SCREENCAPTURING SOFTWARE.